A trip overseas is never easy. You plan for months, making sure everything is in order. Passports have to be issued. Presents ordered. Bags packed and re-packed. Airline tickets monitored for months to get the best seats and price possible on a reliable airline. Alona and I, with of our 15-month-old son, Roman, set out for Ukraine flying British Airways (BA) so he could meet her family for the first time. BA’s ticket pricing was stellar. We spent $1,800 in April to purchase two adult economy fares with one infant in the lap. It was $200 less expensive than our 2015 fare with Delta/KLM which didn’t include the infant fare. Over the years I had heard good things about British Airways. They regularly outrank all American-based airlines in ratings and I seem to recall flying with them once or twice in years past and having no issues. Back in late March BA had a massive global IT failure that caused tens of thousands to miss flights. Knowing a bit about how IT works, given my background in it, I was stunned that something as ludicrous as unplugging a power cable could or a power surge, as claimed by BA, shut down an entire international system for days. Turns out that isn’t what happened, but nevertheless, BA wasn’t prepared. That should have been a red flag, but we had great seats and there were no better options available so we stuck with our plans. So, tickets booked. Bags packed. Off we went! 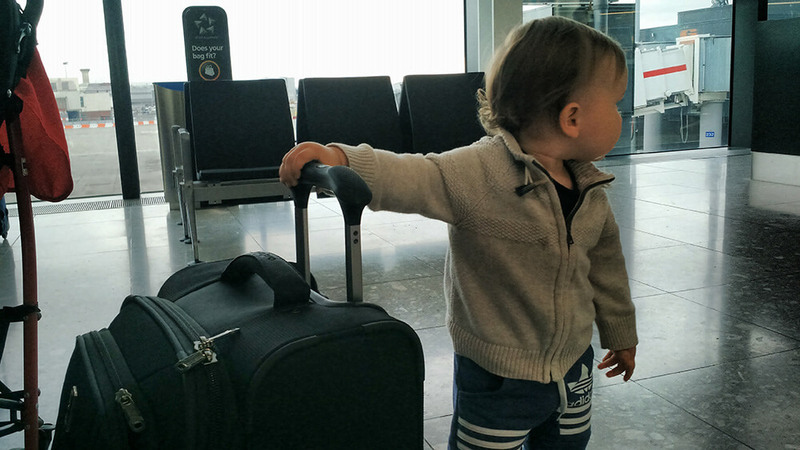 Our son, Roman, now has more experience traveling by air than either of us did until we were in our 20’s. Things started off on a sour note. We sat in our plane on the runway for an hour and a half waiting to leave IAD. Not much time was recovered in the air, so we had to run through the airport to make our connection. I’ve never had to do that in my entire life, and it’s not something I want to do again. We had a two-hour layover in Heathrow, which I foolishly thought would be enough. Even without the delay in arriving, I think two hours would have been tight. Part of the reason we were so rushed was that Heathrow security was overzealous in their reviewing of liquids and children’s items. They threw away unopened applesauce packets, a bottle of children’s Benadryl, and a bottle children’s ibuprofen because they were slightly over their 100ml limit (a limit US airports don’t impose for children’s items). The employee reviewing items knew that we and others were in danger of missing our flights, but seemed to relish in inspecting each item individually, asking what it was, and if we had a prescription for it. No, sir, we don’t have a prescription for over-the-counter ibuprofen. It’s over the 100ml limit? TOSS IT. We don’t have time! I just wanted to reach out and make you aware of a few issues we ran across during our recent flights with BA. The first flight was delayed for over an hour and a half on the runway waiting to taxi and takeoff. 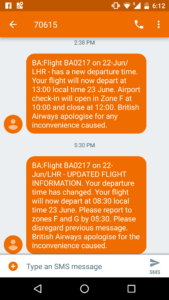 This was apparently due to a queue caused by storms, but the ensuing delay was handled poorly by the BA staff on the plane with almost no updates during the wait except to tell us that the flight tower wasn’t giving them any information. This caused an increased level of tension and worry among passengers and made an already difficult trip for parents of an infant such as myself even more stressful. The condition of the aircraft itself was what I think could generously be called ramshackle. The area near our seats was dirty, with stains visible on the wall in front of our seats under the infant table and a coating of dust so thick on the overhead lights that I didn’t touch them for fear of it falling on to us. There were no air vents, no electrical outlets for charging, and the galley was so loud that our son barely slept during the entire 9hr+ trip. I realize that some things cannot be helped, but I hold BA to a higher standard than budget airlines and was disappointed by the lack of cleanliness and awareness of the staff, who although very courteous and happy to help, seemed oblivious to their surroundings at times. That was our first flight. The second, from Heathrow to Kiev, was also frustrating. This plane lacked basic amenities such as charging capabilities as well, and didn’t even offer free drinks and a snack on a 3hr flight. Instead, the staff came around immediately after takeoff, blocking passengers from accessing the restroom, to offer drinks for purchase. I was stunned. I’ve never seen an airline charge for a Coke before. This was quickly followed up by *several* trips up and down the aisles by staff hawking duty free wares to generally disinterested passengers. Again, the staff were generally pleasant but the policy of charging for basic beverages seems petty and cheap. This was especially stark in contrast to the 3+ trips made by staff on the previous flight handing out water/juice (this doesn’t include trips offering tea/coffee, of which there were at least two, and misc drinks on a cart, of which there were at least an additional two). Seriously – I counted at least four water/juice trips in the space of two-three hours. How is anyone supposed to sleep with people constantly coming back and forth, and how can BA afford to offer so many free drinks on one flight and absolutely none on another? Overall, I’d say our experience with BA left a lot to be desired. The form states that a response should be expected within one business day. After 11 days without a response I tweeted BA and they asked me to be patient. After three weeks, and strangely on the exact day we were returning home, I finally received a response. Seen below, it’s not much more than a series of apologies, excuses, and deflections. Thanks for getting in touch with us about your flight to London Heathrow. I apologise for the delay in my response. I completely understand why you’re disappointed with the standard of our World Traveller cabin. I absolutely agree this isn’t what you’d expect from us, especially as you were travelling with an infant. I can see how unpleasant your journey must have been and we know how important our aircraft’s appearance and cleanliness is. We’ve made improvements to our cabin environment which included spending more on specialist cleaning equipment. We’ve also set up new performance-based contracts with the cleaning company we use, which helps us maintain our usual high standards. We’ve also looked into our own processes to make sure the problems that are reported are dealt with as quickly as possible. We’re grateful you’ve taken the time to tell us what happened, as it’s only through receiving your comments we know where to focus our attention. I’ve looked at our flight records and can see your flight BA0216 on 31 May was delayed due to airspace restrictions being in place that were outside of our control. We take all reasonable measures to avoid delaying a flight and we always consider of there are any operational options available before we make a decision. We’re very sorry the delay was necessary on this occasion. Thanks for your feedback about our new catering offering. I appreciate your disappointment because we no longer offer a complimentary catering service, however please let me explain our position. We’ve partnered with another great British brand, Marks & Spencer, to offer customers the option to purchase great food on board. The new catering offering is available in our Euro Traveller cabin, as well as on UK domestic flights to and from London Heathrow and London Gatwick. The catering offering in our Club Europe cabin remains complimentary. The change was made following extensive customer research and feedback, which found customers wanted meals which reflect what they’d normally choose on the go. We offer fresh, premium quality food, so we can give our customers the best on board dining experience. The food and drink options available are fairly priced. We’re not charging inflated prices like some low-cost carriers. I’m sorry you weren’t aware of the change to our catering offering. All affected customers who made their booking directly with us were contacted by email shortly after the change was announced. We also made our trade partners aware for those who made their booking through a travel agent. In addition, our website was fully updated. We’re very grateful you’ve taken the time to let us know how you feel. It’s only through your comments we’re able to focus on areas where we need to improve, so we can offer you the best possible service. We know there’s still more work to be done in this area, but I know you’ll see positive changes very soon. I hope you and your family on board again soon. Please feel free to contact me directly using the blue link below if I can help you with anything else. I simply don’t believe that customers of any company would say they don’t want free drinks and snacks on a short flight, no matter what the quality issues are. I don’t expect more than a bag of nuts and a Coke, but apparently, that’s too much to ask of BA. The marches up and down the isles by BA cabin crews hawking food, drinks, and duty-free wares were egregious and continued in our second short flight. Despite all of these issues, the trip to Kiev would feel like a fond memory once we headed back home three weeks later. The flights and plans were identical for our return trip. Prior to checking in, I found that BA had changed our seats on the short flight to ones slightly less desirable but that didn’t cause much concern as all of the seats on that flight are close to the same. I checked in online and after another three-hour car ride, we were at KBP in plenty of time for our flight. That ended up not mattering one bit. BA 883 from Kiev to London was delayed both leaving the airport and then again landing at Heathrow, where we circled in the air tediously before landing. These delays caused us to miss our flight to DC, BA 293. While waiting for our stroller we asked the gate attendant about our flight and were informed that we had already been removed from it. BA knew we were on the plane and that it was delayed, but their priority was simply to leave on time (for a change), rather than to consider the needs of the customers on their other delayed flights. So we headed to customer service where an agent recommended that we fly out the next morning on BA 217. She mentioned a later flight through another company but said she couldn’t guarantee good seating (we were hoping to get the infant seating with bassinet availability). She booked us in those seats on BA 217, provided vouchers for a hotel, transportation, and meals, and sent us on our way. We were frustrated but tried to stay positive and make the best of it. So you might be thinking, hey, you got to stay in London for free! Why are you complaining? First, we weren’t in the London you or I want to visit. We stayed in the Renaissance Heathrow which is a renovated Ramada that looks like it had previously been a Soviet Bloc prison complex. Our room was possibly the smallest they have, with two twin beds, and no bathtub. It was so far away from the elevators that it was actually a nuisance to leave the room for anything. They didn’t have USB charging except for a single port on the back of the TV which had to be left on and trickle charged so slowly it took all night to fully charge a single phone. There were no US standard power outlets, and they were out of converters. The elevator required your room key to use, but the room itself required the key to enable power, so we had to do anything and everything as a family. They dinner voucher didn’t include room service, and the restaurant didn’t let me order from the menu, so I had to prepare a tray myself from their dinner buffet and haul it upstairs. The thermostat controls were in German. The room key didn’t work. I could go on. I won’t because you have to do other things today, right? We didn’t do anything in London except sleep, eat, and ride the shuttle to and from the airport. It was not fun. We left the hotel hours ahead of our flight and were on board and ready for takeoff along with hundreds of others on flight BA 217 at 9:40AM. After taxing on the runway for a bit we returned to the gate when the pilot informed us that there was a fuel pump issue. We were later told that the plane had 23 fuel pumps and that two may not be working, although they would fly if they could get one back up. I thought I overheard one of the flight attendants tell someone they had fixed one pump, but I’m not sure. After two hours of tedium and announcements that “it wasn’t looking good”, we were told they couldn’t fix the issue and they were arranging buses to take us back to the airport. This was a massive disappointment; in the end, we would be sitting on that useless plane for over three hours. This plan sounded unlikely due to the tight timetable, but at least we’d be in the air soon and wouldn’t have to worry about another hotel stay and rebooking. Not ideal, but we were optimistic that we’d be in Washington before nightfall. What happened next sounds like something from a Marx Brothers movie. At 1PM we boarded a bus which, instead of delivering us to Terminal 5 Gate B, dropped us off at Arrivals. Several of us questioned the driver about this, and he said that’s where he’d been told to go, and that he knew nothing more. We knew something wasn’t right. Why had we been dropped off somewhere so far from Gate B? Why were we dropped off at the location we’d be sent to if we were expected to exit the airport? We headed for the BA customer service desk where a passenger asked a stern employee what was going on. He told her that BA 217 wasn’t scheduled to leave at 3PM today, but rather 3PM tomorrow, and that we all needed to go through immigration, gather our luggage, leave the airport, and come back through arrivals and go to rebooking to get back on the flight. This was a shock. The news spread quickly as other confused passengers began to appear, and soon the employee was surrounded by angry, tired, hungry humans bombarding him with the same question: why would your pilot tell us explicitly, several times, that the plan was to board the plan today at 3PM if that was clearly not the plan? He had no answer and kept repeating that this was the information he’d been given by control. As the group grew larger, another employee surfaced with the same information, and he was swallowed up and didn’t come out of the swarm for quite some time, leaving behind a trail of confused and angry passengers. While others pondered their next move, I quickly jumped in line at customer service, looking over my shoulder from time to time to see if a physical altercation had broken out and to be sure it wasn’t Alona doing the damage. Going to customer service proved to be the right call. The agents there had no further details about the flight or the fact that we’d clearly been lied to – I can only assume to get us off the plane more smoothly – but they went about the business of rebooking. Our agent was the same from the day before, and the look on her face when she saw me let me know she remembered us and knew it was bad news that we were back. I politely declined her offer to rebook us on BA 217 for the following day, and her attempt to send us to Baltimore (she had offered up the same solution the day before – I’m not sure why she thought that was a reasonable alternative). I told her we’d prefer to be booked on another airline, as we were done with British Airways. She booked us on a United flight leaving later in the afternoon but clearly had trouble getting it done. Two agents and a manager worked on it and in the end, said we were all straight. We’d later find out that wasn’t true, either. We were told to go through immigration, grab our bags, leave the terminal, come back in through arrivals at a different terminal, and check in with United. We were not offered food vouchers and were told we should have time to get everything done and make the flight. That wouldn’t have been accurate had the United flight (UA 925) not been delayed by several hours. When we finally made it through immigration, baggage, and back to arrivals, the United employees told us the infant ticket had not been entered into the system properly by BA, so we had to go to United customer service to get it resolved, which they quickly did and even gave us our own row which made a very positive difference in our flight experience. The United staff even gave us two £12 meal vouchers. We were told by another BA passenger from our flight that he had been given a voucher by BA but only after asking for one and it was only for £5. Hope he enjoyed his soda and crackers. After we went through security for the second time that day we ate lunch, relaxed a bit, and comfortably boarded our flight. We were able to get Roman properly situated and he slept through the entire eight-hour flight; a feat unheard of in all of recorded history. Not only were we lied to on the plane about the flight leaving that day at 3PM, it turns out that the employees telling us that flight BA 217 leaving the next day at 3PM wasn’t accurate, either. I later received text messages showing not only BA’s inability to plan despite having a three-hour delay to work with while we were on the plane, but then not being able to stick to their own fictional timetable and changing it at least three times. They told customers to be at the airport at 5:30AM to check-in and rebook for an 8:30AM boarding. BA 217 ended up leaving at 9:50AM the next day when we were already home. Heathrow is to blame, too. Their inability to properly manage flights caused delays all over the boards. Several other passengers who weren’t even on our flight mentioned their problems with Heathrow, too. Our pilots were clearly frustrated in public announcements while we were on flights and didn’t try to sugarcoat it. A huge international hub like Heathrow should be better at what they do. The signs are confusing, the airport is far too large to navigate reasonably. Massive sections of terminals that were completely vacant, making me wonder why there were even in use. Some consolidation seems to be in order. I’ll never fly British Airways again. Any company can have problems – even an unfortunate series of them – and we eventually got home, but their inability to deliver on their promises, ridiculous and tedious reply to my complaint form three weeks after it was originally sent, massive confusion amongst their own staff, faulty planes, and blatant, self-serving lie about our flight being prepared for that day were too much to bear. If I can, I’ll also avoid Heathrow. The airport does nothing better than any other airport and frequent routing issues lead to delays across all airlines. It’s just too massive and their security is far too aggressive. There was no reason to take our child’s medicine and their lack of empathy and disregard for urgency in their work show that they don’t take customer satisfaction seriously.